Further colours are subject to delivery times. The anterior and posterior teeth are comprised of the proven VITA quartz feldspar ceramic, with the significant material and wear resistance ensuring prosthetic teeth that offer considerable durability. The properties of the material used also make these teeth an ideal choice for patients who are allergic to MMA. 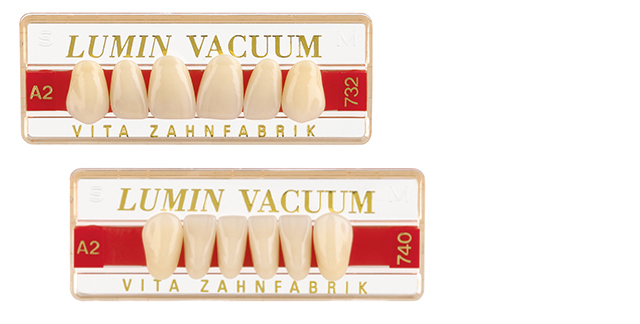 VITA LUMIN VACUUM anterior teeth are perfectly adapted to both VITA LUMIN VACUUM posterior tooth lines.